Europe’s first great civilization was the Palatial Society of Minoan Crete. But really Minoan Crete was as much a part of Asia as Europe. The Ancient Egyptians referred to the Minoans as from the "Secret Lands of the North of Asia". Most archaeologists and historians explained the development of the Minoan civilization as a natural expansion of Near Eastern influences. However, in 1972, Renfrew began arguing for an indigenous development of Minoan and other Aegean civilizations sparked by increased productivity through advances in agriculture, notably the cultivation of olives and grapes. Whatever the true origins of the culture were, it is clear that the Minoans were highly advanced engineers, being the first civilization to use underground clay pipes for sanitation and water supply. Their beautiful frescoes depict serene peaceful occasions and there is little evidence of large scale warfare during their golden age. The Minoans worshiped goddesses. Although there is some evidence of male gods, depictions of Minoan goddesses vastly outnumber depictions of anything that could be considered a Minoan god. While some of these depictions of women are speculated to be images of worshipers and priestesses officiating at religious ceremonies, as opposed to the deity herself, there still seem to be several goddesses including a Mother Goddess of fertility, a Mistress of the Animals, a protectress of cities, the household, the harvest, and the underworld, and more. A major festive celebration was exemplified in the famous athletic Minoan bull dance, represented at large in the frescoes of Knossos and inscribed in miniature seals. In this dangerous feat, both male and female dancers would confront the bull and, grasping it by its sacred horns, permit themselves to be tossed, somersaulting over its back to alight behind it. During the Greek Classical Age, Plato wrote of the long lost glorious civilization of Atlantis that was destroyed by earthquakes and a great flood. There is now mounting evidence that a volcanic eruption and subsequent tsunami at the Minoan island colony of Akrotiri was a major cause of the decline of Minoan Civilization, leading writers such as C. Pellegrino to identify the Minoans as the inspiration for Plato’s Atlantis legend. 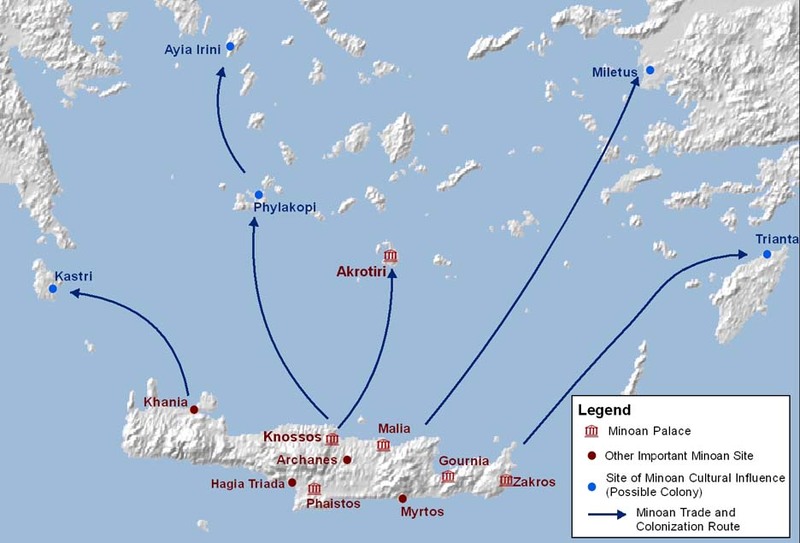 Minoan Crete was finally overrun by Mycenaean invaders from the Peloponnese.